Two component epoxy resin system: resin and hardener. 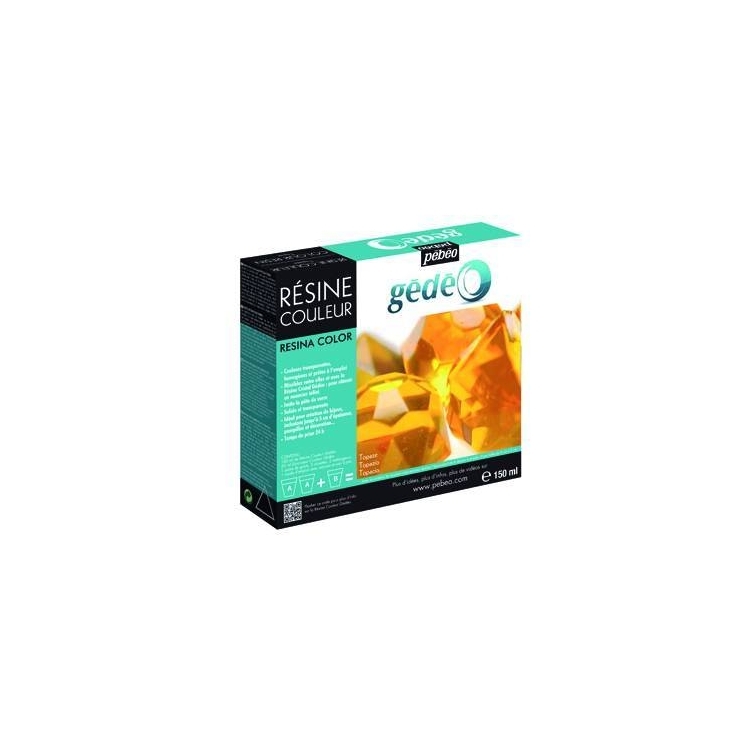 Gédéo colour resins offer endless possibilities of shades to colour your creations. Transparent and solid, perfectly imitates glass paste. Two component epoxy resin system: resin and hardener. 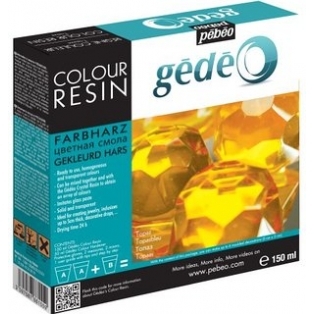 Gédéo colour resins offer endless possibilities of shades to colour your creations. Transparent and solid, perfectly imitates glass paste. No more risks of poor handling by adding dyes. Surfaces: Glass, pottery, metal, silicone, painted wood, plastic, moulding of decorative objects. Conservation: 6 months in its closed jar after opening. 1. In a dry and clean recipient begin by pouring 1 dose of Colour Hardener B followed by 2 doses of Colour Resin A. 2. Mix well the two components all the way to the corners of the recipient (incomplete mixing does not guarantee the hardening, mixing too strongly can create the appearance of bubbles). Transfer the mixture into a second recipient and mix again to ensure homogeneity of the resin and optimum hardening. 3. Pour into the surface of your choice. 4. Let dry 24 hours away from dust. The hardening is progressive and varies with the room temperature. 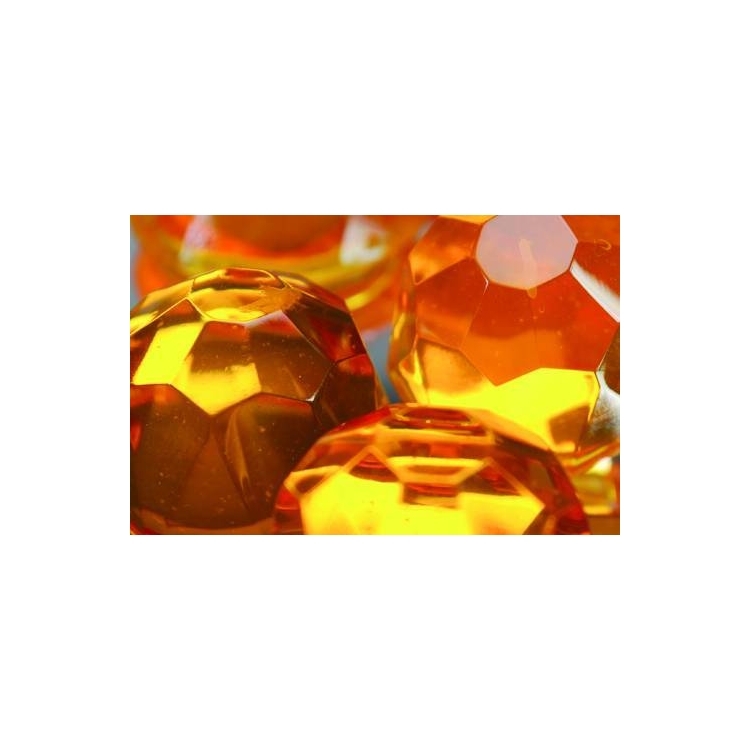 - To verify the required quantity of each component and not waste the product, fill the mould to be used with water and pour into a measuring cup: a third of the volume for the hardener and two thirds for the resin. Dry the mould and the measuring cup before pouring the colour resin. - The mixture is homogeneous when it becomes transparent. To give an appearance of shine to your projects, use the Gédéo GLOSS + varnish or Gédéo crystal resin in thin coats. 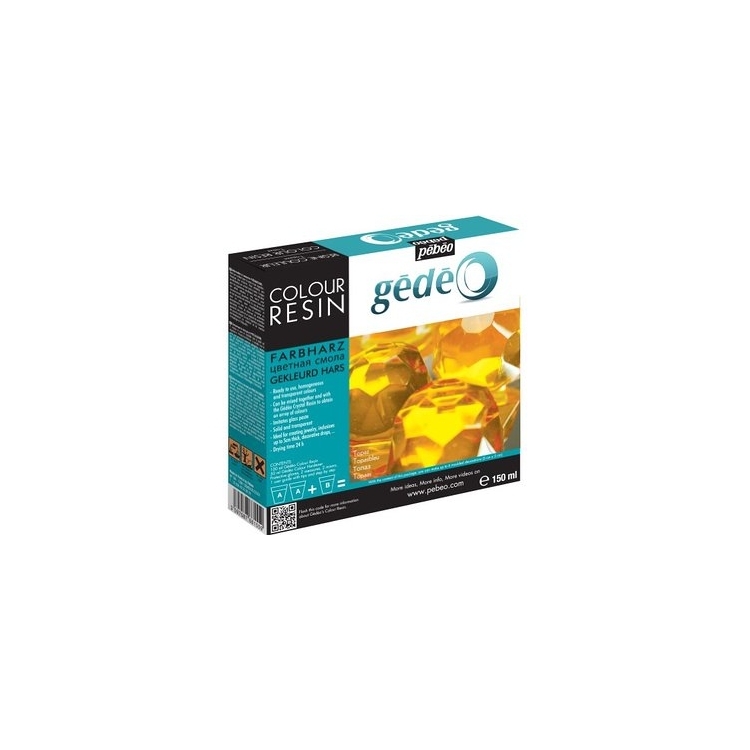 - Do not mix components from Gédéo colour resin with components from Gédéo glaze resin. - Do not exceed 150ml of colour resin preparation per mix.